A last-minute, highly ambitious rumor suggests Apple could feature "never before seen" haptic feedback touch technology in today's unveiling of the third-generation iPad. The claim comes from Pocket-lint, which received comment from a spokesman for the company Senseg, which has built a unique haptic feedback method for touchscreen devices. The spokesman said Senseg "won't be making any statements until after Apple's announcement," fueling speculation that the company could be involved in today's anticipated "iPad 3" unveiling. Senseg's technology changes the surface of a touchscreen device through electric fields so that a user's fingertips can feel complex, context-sensitive textures to aid their input. It can make a surface feel smooth or rough to the touch based on what is presented on a device's screen. If such technology were to be included in Apple's third-generation iPad, it would be a major surprise, as Wednesday's report filed only hours before Apple's media event is the first indication of any such feature. Author Stuart Miles said Apple's official invitation to today's event, which says the company has something "you really have to see. And touch" could be hinting at a partnership with Senseg. Separately, The Guardian also speculated this week that Senseg could be the "touch secret of Apple's new iPad." Senseg officials met with the newspaper in January, at which time the directors said they were talking to tablet manufacturers but would not comment on any negotiations with Apple. Again last week, a Senseg official reportedly said that it would "be for Apple to say" whether the two companies have established a partnership. While it's likely Senseg officials are being coy in an attempt to drum up publicity for their technology ahead of Apple's iPad unveiling, Apple has previously shown interest in similar haptic feedback technology for touchscreen devices. One patent application discovered by AppleInsider in 2009 described a dynamic tablet screen surface built on an "articulating frame" that would give users tactile feedback when typing in order to identify individual keys. "The articulating frame may provide key edge ridges that define the boundaries of the key regions or may provide tactile feedback mechanisms within the key regions," the application reads. "The articulating frame may also be configured to cause concave depressions similar to mechanical key caps in the surface." But unlike Apple's proposed invention, Senseg's technology has no mechanical moving parts. 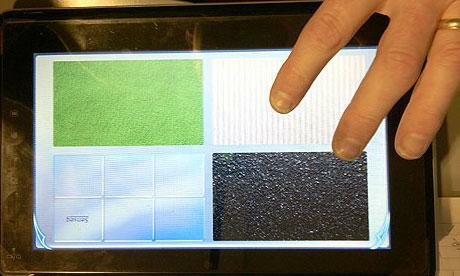 Instead, it uses an electrostatic field to give users the sensation of textures on their fingertips. In an interview in December of 2011 with CNet, Senseg's Dave Rice indicated that he was hopeful that his technology would end up in consumer tablets in the next year. But he said the timeline "might extend to 24 months," making the possibility of it appearing at Apple's iPad event today seemingly too ambitious.